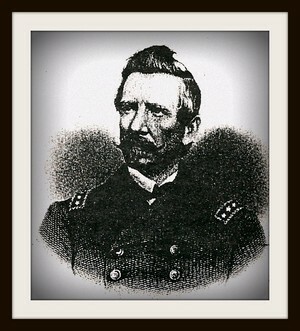 In July 1863 the coaster, Atlas, brought an official letter of introduction to the Governor from Raphael Semmes, the “gallant captain” of the Alabama, a copy of which was immediately sent to the United States Consul. He said the Captain was most courteous and gentlemanly. He asked Captain Boyce to land some thirty prisoners for him in Table Bay, with which request Captain Boyce was unable to comply. Captain Semmes said the Florida was also a short distance off the Cape, and that the Alabama, when she had completed her repairs and was cleaned and painted, would pay Table Bay a visit. He expected to be there, he said, very shortly. Shortly after the Atlas arrived, the news that the Alabama was coming into Table Bay, and would probably arrive about four o’clock that afternoon, added to the excitement. About noon the signalman on the hill spotted a steamer. This could either be the Alabama, or the Hydaspes from India, or the Lady Jocelyn from England. Just after one it was signalled that the Confederate Steamer Alabama, was approaching from the Northwest, and Federal bark from the Southeast. The inhabitants of Cape Town, where about to witness a capture by the celebrated Confederate craft, close to the entrance of Table Bay. Crowds of people ran up the Lions Hill, and to Kloof Road, to get a good view. All the cabs were chartered, and orders were given to drive as hard as possible. ” As soon as the cab reached the crown of the hill we set off at break-neck pace down the road, on past the Round House until we came near Brighton, and as we turned the corner, there lay the Alabama within fifty yards of the unfortunate Yankee. As the Yankee came round from the Southeast and about five miles from the Bay, the steamer came down upon her. The Yankee was evidently taken by surprise. The Alabama fired a gun and brought her to. “When we first got sight of the Alabama, it was difficult to make out what she was doing; the bark’s head had been put about, and the Alabama layoff quite immovable, as if she were taking a sight at the ‘vannint’. The weather was beautifully calm and clear and the sea was as smooth and transparent as a sheet of glass. The bark was making her way slowly from the steamer with every bit of her canvas spread. The Alabama with her steam off appeared to be letting the bark get clear off. What could this mean? No one understood. It must be the Alabama. ‘There’, said the spectators, ‘is the Confederate flag at her peak; it must be a federal bark too, for there are the stars and stripes of the States flying at her main’. What could the Alabama mean, lying there idly as a painted ship upon a painted ocean. Capetonians unequivocally showed where their sympathies lay: with the Southerners, the struggling Confederates. The irony of it all was that there were no economic or other ties with the American South; on the contrary, Cape Town depended heavily on the export of the Colony’s wool to the northern parts of America. For this reason there was an American Consul in the city and a few American merchants had offices here. The Alabama remained a topic of conversation for many months. 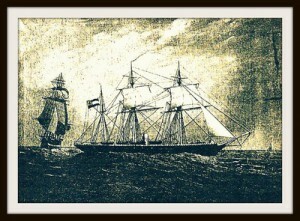 Thomas Bowler did a watercolour of the ship leaving Table Bay and, from the breakwater, also an unfinished sketch of the Alabama and the Lady Jocelyn. The next year, on 20th March, the Alabama put into Table Bay once more for coal and other supplies. Again a horde of sightseers and sympathisers crowded the wooden sides, but the captain was evidently in a hurry and within three days the Alabama was ready to sail. A few months later, outside the French port of Cherbourg, the raider went under after a battle with the “Northern” warship Kearsarge.